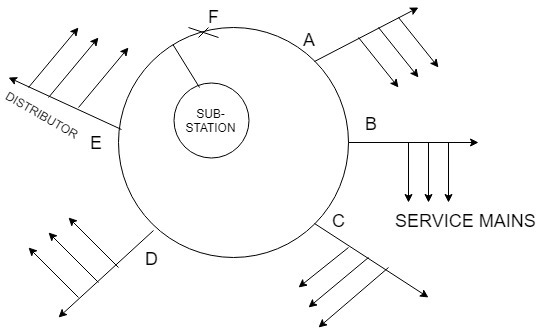 In the Radial Distribution System, the distributor is connected to a Sub-station only one way through Feeder. Here the system is diverging from a single point (Sub-station), so it got a name Radial Distribution System. Any fault which occurs on the feeder disturbs the consistent flow of power to the end consumers. The end consumer has to wait until the fault has been rectified. Mostly, this system won’t be preferred. For example, In the above diagram, Feeder A and Feeder B are getting power from a single Sub-Station. Any fault which occurs between Feeder and Sub-Station will disturb the End Consumer from getting Power. Mostly this system is used for an end consumers between a few kilometers radii to the Sub-Station. In this modification, the end consumers get power even a fault occurs on anyone feeder. If a Feeder A is affected by a fault, the end consumers get power from Feeder B. If a Feeder B is affected by a fault, the end consumers get power from Feeder A and Feeder C.
If a Feeder C is affected by a fault, the end consumers get power from Feeder B. The best method for shorter distance power transmission. Can be easily installed for shorter radii. The cable expense in usually low in this method. Highly Economical for shorter distance power transmission. In the non-modified method, any fault which occurs between the Sub-Station and Feeder would affect the End Consumers from getting Power. The Sub-Station Failure would also affect the End Consumers from getting Power. In the Ring Main Distribution System, the feeders are connected in a ring type fashion (Closed Loop System) hence it got a name Ring Main. This Ring Main Distribution System eliminates the drawbacks of the Radial Distribution System. Here the faults, which occur on the anyone part of the loop won’t affect the End Consumer from getting the Continuous Power Flow. The faulty portion and can be isolated and maintenance can be done without giving trouble to other feeders. Consider a fault between the Feeders A and B. In this case, we can isolate the portion between these two Feeders and do maintenance without disturbing Other Feeders. The Feeder A will get power from Sub-station and the Feeder B will get power from the Feeder C.
There won’t be power issues for End Consumers in this Case. In the above picture of Ring Main Distribution System, Consider the cross marked region “F” as a fault. In this case, we cannot isolate that particular Portion since the Sub-station is connected to the Feeder. The Feeder A will get power from B, the Feeder Will get power from C, the Feeder C will get power from D and the D will get Power from the Feeder E.
There would be a Voltage drop at the farthest ends. To overcome the Drawbacks the Ring Main Distribution System, the Ring Main Distribution System with Interconnectors has been Introduced. In this System, an Interconnector has been included between the Feeder B and the Feeder D. In case if a fault occurs between A and E (Marked as F in that picture), the interconnector will keep the entire system stable and there won’t be any Voltage Fluctuations. 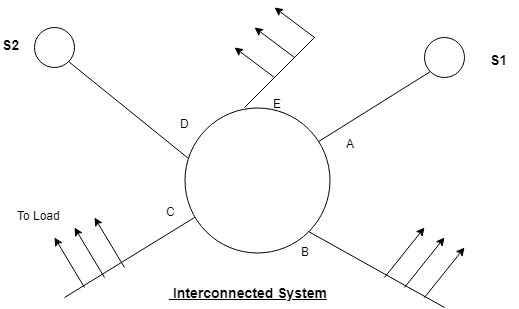 Note: Analyze this diagram with case 2 of Ring Main Distribution without Interconnector. The Interconnected System Overcome the Drawbacks of all other systems. Here more than one sub-station driven to a feeder. In case if one Sub-Station fails, the end consumer can get power from Other Sub-stations. 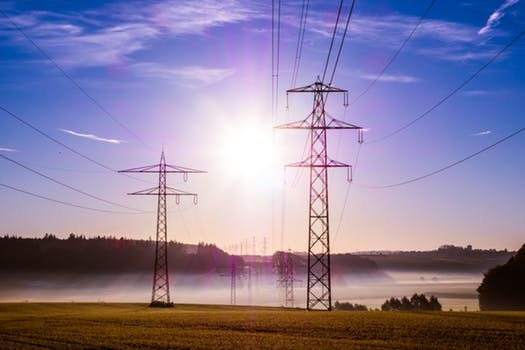 By Interconnecting all feeders with more than one Sub-station, the downtime can be avoided. Note: More Sub-stations can be connected in the Interconnected System.